For users who find the mobile device USB driver is not showing up in Device Manager, it means your Apple device is not recognized on Windows 10 or the driver for Apple is missing for unknown reasons. In this sense, you would better manage to download apple mobile device USB driver for Windows 10 to see if the Apple device can be connected to your computer. Your iPhone can’t just be recognized as a camera or in recovery mode on Windows 10. In order to make your apple device work normally, for instance, import photos, videos or documents to PC, you need to download iPhone drivers for Windows 10. How to Download Apple Mobile Device USB Driver for Windows 10? If you hope to install the Apple USB driver on your computer, there are several ways open to you. While at the beginning, if you come into the Apple mobile device USB driver is missing from Windows 10, you may as well choose to uninstall the erroneous iPhone driver and then download a new one for your PC. In the first place, if you wish to fix apple mobile device driver is not in Device Manager on Windows 10, just attempt to get rid of the Apple driver and then install the latest Apple USB driver in Device Manager. It is said that Device Manager is capable of getting you updated device drivers in some cases, so for the purpose of solving apple mobile device USB driver missing from Windows 10, you can try to download the driver for your iPhone. 2. 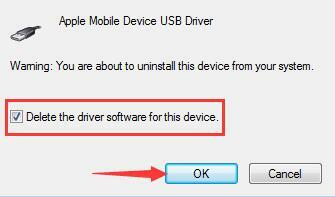 In Device Manager, under Universal Serial Bus controller, right click the Apple Mobile Device USB driver to Uninstall. 3. Then tick the box of Delete the driver software for this device and then hit OK to move on. 4. 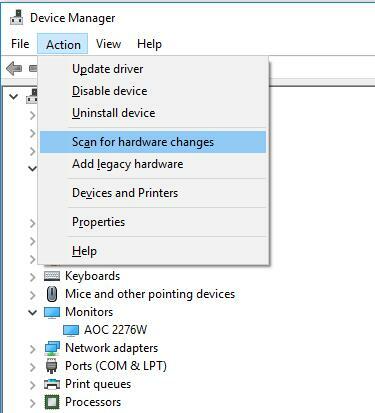 Then go back to Device Manager and then under Action, click Scan for hardware changes. 5. After scanning for hardware changes, you can see the Apple Mobile Device USB driver is installed automatically for Windows 10. Now it is likely that the updated Apple driver is downloaded from Device Manager and there is no more unavailable iPhone driver on Windows 10. On the occasion where the Device Manager failed to find the apple driver for Windows 10, perhaps you have to download the driver for apple by yourself. Out of safety, you would better decide to get the apple mobile device USB driver on the apple official site rather than the third-party website. Just navigate to the Apple official site and then select the driver of your iPhone. And then download, install it on Windows 10. With this up-to-date apple mobile device USB driver in Device Manager, your apple would be detected and connected with your computer. Or for some people who have no time or energy to download the driver by yourself, you can also choose to download apple mobile USB driver automatically by a driver downloading tool. Tips: How to Fix iPhone or iPad Not Recognized on Windows 10? Normally, once the new Apple mobile device USB driver is downloaded on Windows 10 when you manage to connect the iPhone or iPad to Windows 10, it will be recognized automatically. If not, maybe you can try to unplug and then plug in the phone again to see if it works. In a word, no matter you are to download apple mobile device USB driver just to update the driver for Windows 10 or to resolve apple driver is not showing up in Device Manager on Windows 10, these threes methods are always available for you.